now just before i start into this piece, let's get the excuses out the way: i was up early on saturday morning, then i'd to ride into a gale force wind to get to the port mor wheelers before riding home into the same wind. then i was playing a gig in the evening, so i'd drums to set up, play, take down and get home around 1:30am which, due to the commencement of british summertime, meant it was actually 2:30am. so having matched a saris powertap rear hub with a garmin edge 705 gps unit, it's no surprise that the figures displayed would not be the least bit worrying to sir chris. a couple of years ago, cyclepowermeters.com were kind enough to release an srm crank for test on the company colnago - a test which was no more impressive in the numbers game, but which suffered, to my mind, from requiring a trail of wires along the down tube, as well as a sensor stuck inaccessibly on the bb lug. this time it was yet again cyclepowermeters to the rescue, sending a handbuilt wheel featuring a pro+ powertap hub and mavic open pro rim. not that it was really intended to be a part of the test, but the wheel (building of which is sub-contracted to a third party, due to a high degree of business at cyclepowermeters) was darned well built, surviving less than billiard table surfaces with aplomb. 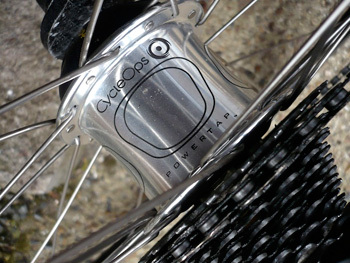 saris have incorporated the all but proprietary ant+ wireless networking protocol into their current crop of hubs (an upgrade is available to those purchasing before this became the norm), allowing pairing with suitably enabled 'head units', in this case, a garmin edge 705.
cyclepowermeters can supply the rear hub with either a shimano or campagnolo compatible hub, a particularly pleasant offer these days when the former seems a smidgeon overweening. there really is little to compare with the comforting snap of a complete campagnolo drivetrain. i can't pretend that this worked perfectly, for reasons that i don't understand; after the initial setup, i had some very impressive numbers display on the screen, impressive but for the fact that the bicycle was stationary at the time. first ride gave a bit more of the same, when all seemed to be normal and above board at the point of grovelling up the hill at storakaig, to the accompaniment of some very nice digits on the garmin. sadly flatland riding was less complimentary, but doubtless only too realistic. all this was spoiled on stoppage at debbie's for a wattage infusion when the meter spiked to 16,000 watts, rather skewing the average power reading, and making me a dead cert for the british track team in 2012. by ride number three, however, all seemed to have settled into a comfortable groove with numbers that would have to be doubled and multiplied by the colour you first thought of, before they'd even be considered adequate. still, now's a good time to nip back to the top and read those excuses just one more time. of course, during the ride is not the time to be paying too much attention to the garmin display, that's for the post ride entertainment. assuming you are either a geek, nerd or simply comfortable with the computer age in which we live, the proof of the pudding is in the downloading. part of the reason for this test was my perceived connection between power output and the gps information stored by the garmin: by comparing the power readings with location details it would be possible for rider, coach or both, to figure out where gains could be made; whether power was being lost on the climbs (yes), or on the flat (yes) aiding that all-important training plan. such a comparison seems a great idea until the geek or nerd within realises that there doesn't seem to be any suitable software to undertake this task. cyclepowermeters recommended the wko+ trainingpeaks software or sporttracks: the latter happy to deal with gps map overlays, and the former to give excruciatingly detailed graphs of just where those watts were missing, but combining the two would seem to be a case of installing and juggling both (unless i've missed something somewhere). both are for windoze only: macusers are no less well-served; the online garmin connect allows gps examination, as will garmin training center. 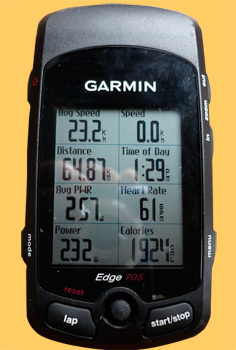 ascent which i have used with the garmin before, promises compatibility with power graphs from the garmin edge, but i couldn't find any way of doing so, and i notice from their online forum, that i'm not the only one in this situation. it seems there might be a gap in the market, if anyone is in the mood to plug it; the notion of comparing power with location seems quite an obvious notion to me - however, i couldn't write a piece of software if my life depended on it. in mitigation, i am well past the stage where any amount of advanced training such as offered by the powertap/garmin combo would make any difference to my performance on the sunday ride. so perhaps the gps/power comparison is simply a novelty i'm chasing rather than perceived as of major use to the aspirational cyclist. nonetheless, in practice, this seems the way to go: no fiddling with an ugly looking chainset, wireless or otherwise, simply a change of rear wheel which is just as easy to swap if you fancy a watts free ride. the wireless performance, first two rides notwithstanding, was first class, as was the wheel itself. the hub was occasionally a bit chattery over less than comfortable roads, but it is a mite larger than your regular campag or chris king offering. seemingly a fit it and forget it solution. the wheels as supplied, built round a cycleops powertap pro+ hub (it even came with velox rim tape) costs £925 direct from cyclepowermeters or you can rent it from £11 per week for a minimum four week period - a garmin edge 705 can be had from an additional £4 per week. if you're not sure whether watts are for you, this might be the more pragmatic introduction to the world of graphs. phone or e-mail bob tobin, because if you could bottle technical support, his would be the preferred contents.